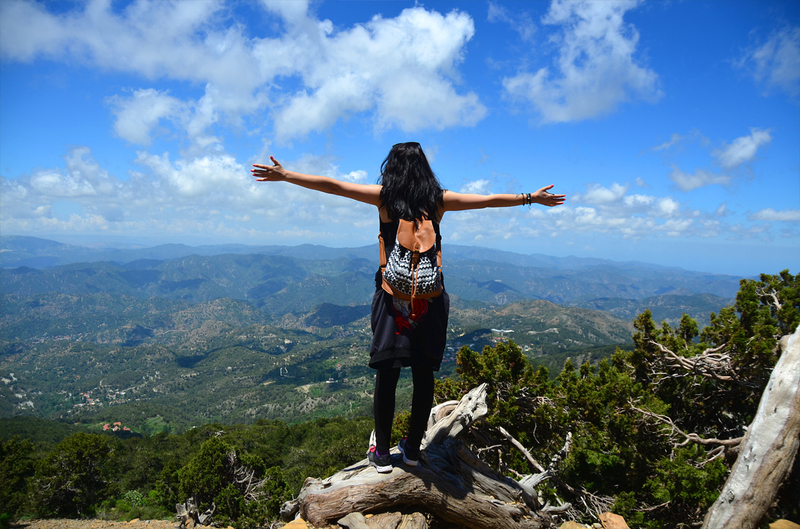 Explore the island’s natural beauty, especially its fauna, flora and mining heritage, by walking its nature trails, which have been created to highlight the beautiful landscapes of Cyprus. A series of unique and complex geological processes have made Cyprus a model for scientists and a key to understanding the evolution of planet Earth and its oceans. 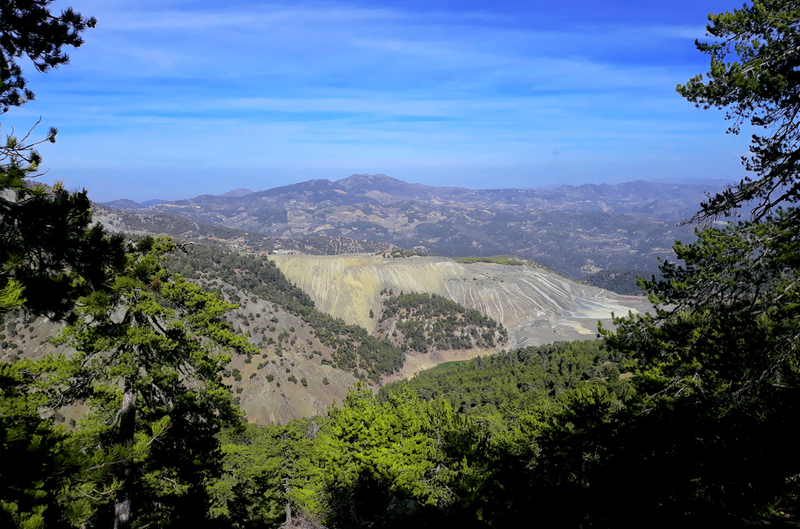 The wooded summit of Troodos is the deepest layer of a piece of oceanic crust and the upper mantle of the earth, i.e. an ophiolite formed 90 million years ago, 8000 metres below the surface of the sea. 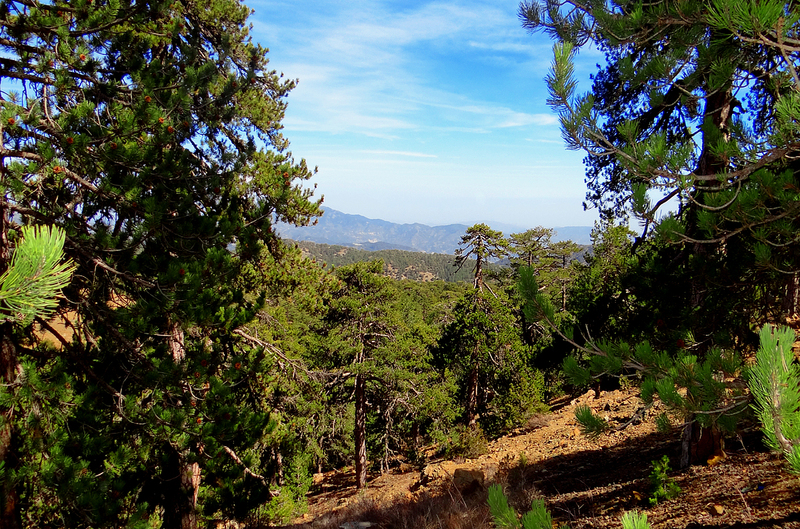 Cyprus’ forests are mostly natural woodlands of great biodiversity and major ecological significance. In general the terrain is easy to cross and so are the trails. The routes start and finish almost at the same place. The Troodos square. 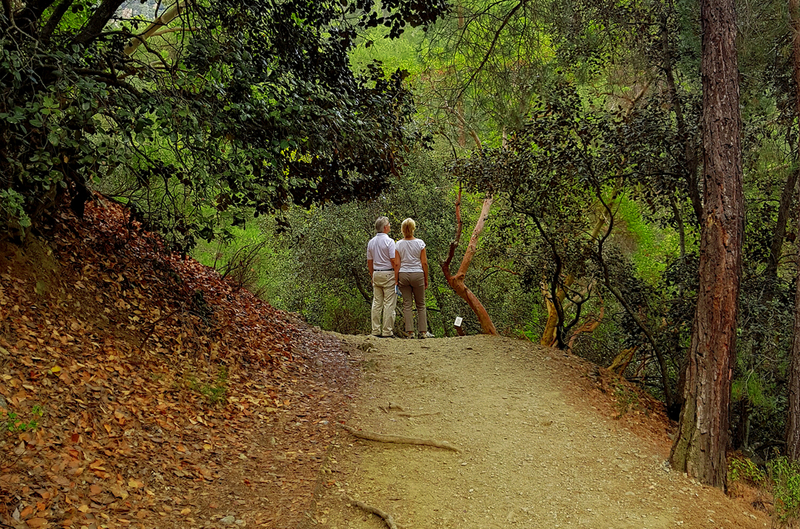 The trails are Atalanti, Persephone, Psilo Dentro-Pouziaris and Kaledonia. Basicaly the Atalanti Route starts at 1730m where the square is, then goes to 1830m and finally ascents back to 1748 again. The routes of Persephone, Psilo Dentro-Pouziaris and Kaledonia starts at 1730m where the square is, then goes all the way down to 1238m and finally ascents back to 1700 again. ENDEMIC PLANTS: Golden oak (Quercus alnifolia), Manouthkia (Pterocephalus multiflorus subsp. multiflorus), Urse mint (Mentha longifolia subsp. cyprica), Foetid Juniper, Troodos Alison (Alyssum troodi). 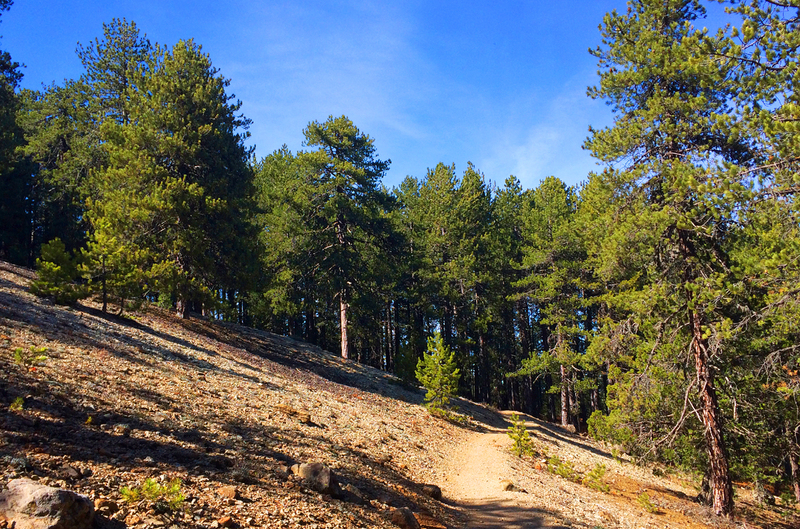 POINTS OF INTEREST: The trail goes around Chionistra mountain at an altitude of 1700-1750 metres, passing through dense areas of black pine trees (Pinus nigra subsp. pallasiana) and Foetid Juniper (Juniperus foeditissima). One of the largest trees, Foetid Juniper is found on the trail; it is 800 years old. There are wonderful views of all areas of the island. The entrance tunnel of the chrome mine, which has been out of service since 1982 is particularly interesting. 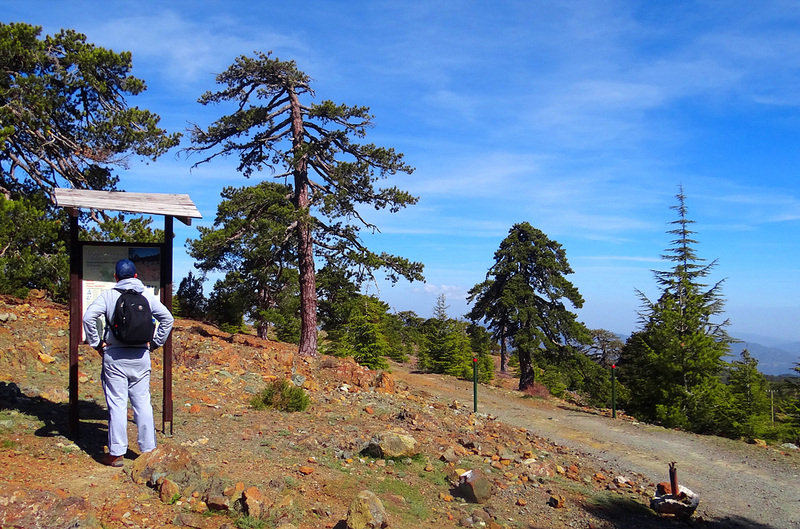 The first finishing point of the trail is 9km along the Troodos - Prodromos road. 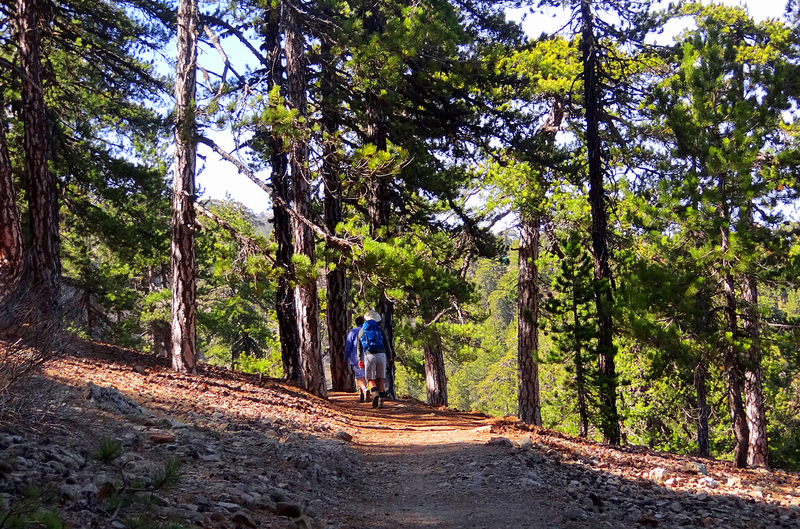 To continue on the trail you must cross the main road and walk on the forest road of Katoikies Chromiou towards Agios Nikolaos tis Stegis church for around 200m, where a wooden sign points your direction; the trail is approximately parallel to the main road and ends at Troodos Square where you will find the Environmental Information Centre of Troodos National Forest Park. 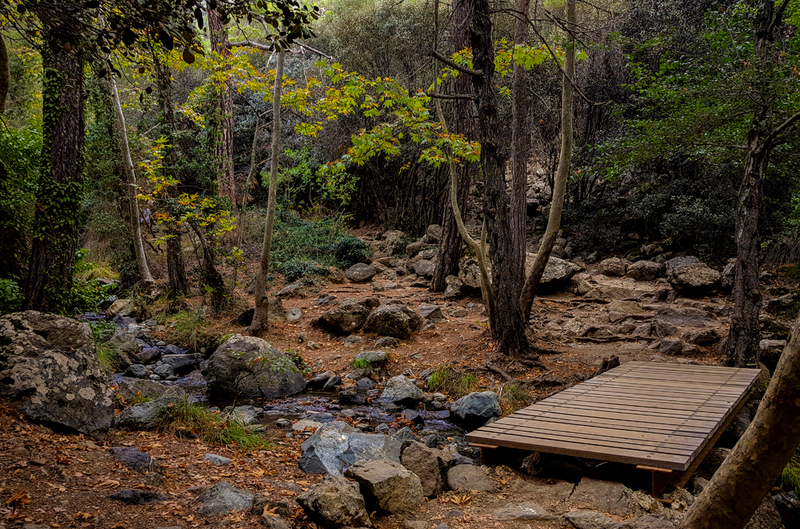 A fountain with drinking water is located 3km from the starting point heading towards Troodos Square. STARTING POINT: 150m south of Troodos Square, in the direction of the police station. ENDEMIC PLANTS: Golden oak (Quercus alnifolia), Cyprus Skullcap (Scutellaria cypria subsp. cypria), Troodos cat mint (Nepeta troodi), Cyprus Germander (Teucrium cyprium subsp. cyprium), Manouthkia (Pterocephalus multiflorus subsp. multiflorus), Troodos sage (Salvia willeana). POINTS OF INTEREST: Lush vegetation. For the first 2km of the route the walker will pass through dense black pine forest. The ending point at Makria Kontarka offers a stunning view. 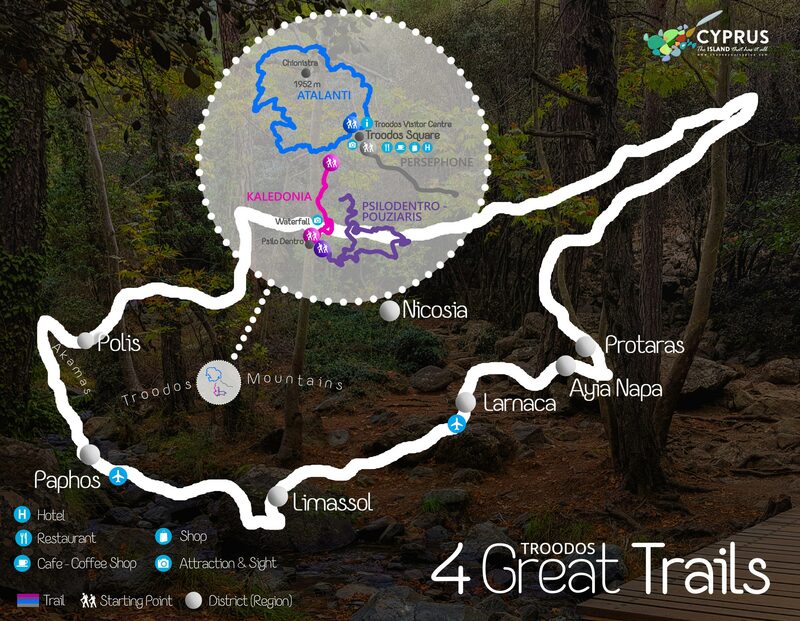 The trail is located within the Troodos National Forest Park and it is part of the European E4 path. 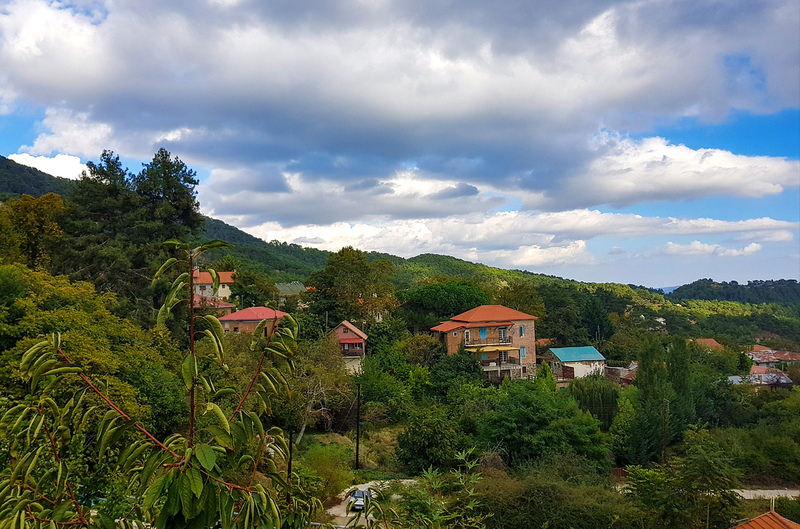 The Kampos tou Livadiou picnic area is located 2km from Troodos Square in the direction of Karvounas, and at a distance of 2.5km you will find the Armyrolivado and Livadi tou Pasia picnic sites. The Environmental Information Centre for the Troodos National Forest Park can be found in Troodos Square. STARTING POINT: The crossing point of the forest road Platres - Mesa Potamos with the tourist road Moniatis - Platres - Troodos, close to the Psilodentro (Tall Tree). ENDEMIC PLANTS: Golden oak (Quercus alnifolia), Purple Rock - Cress (Arabis purpurea), Manouthkia (Pterocephalus multiflorus subsp. multiflorus), Cyprus Skullcap (Scutellaria cypria subsp. cypria), Troodos Sage (Salvia willeana). 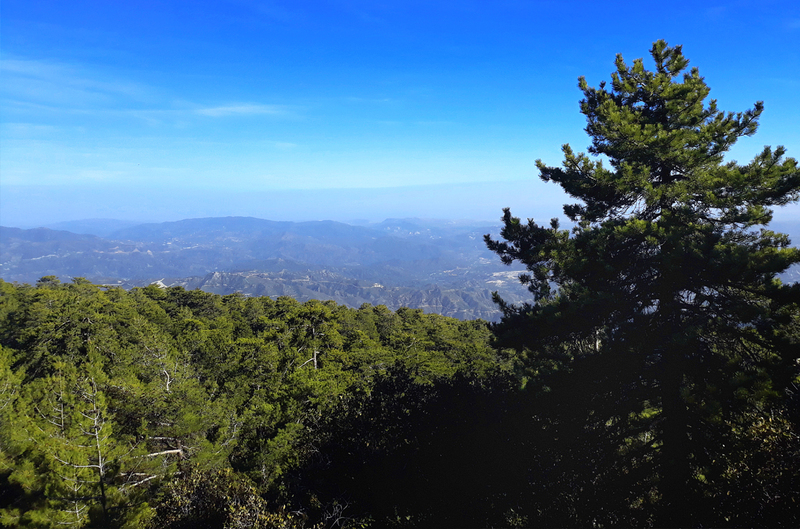 POINTS OF INTEREST: For the first km the path passes through dense clusters of calabrian pine trees, whilst on the 3rd km, at the points with a higher altitude, it passes through an impressive and dense black pine forest (Pinus nigra subsp. pallasiana.) At points along the trail you will experience a panoramic view. 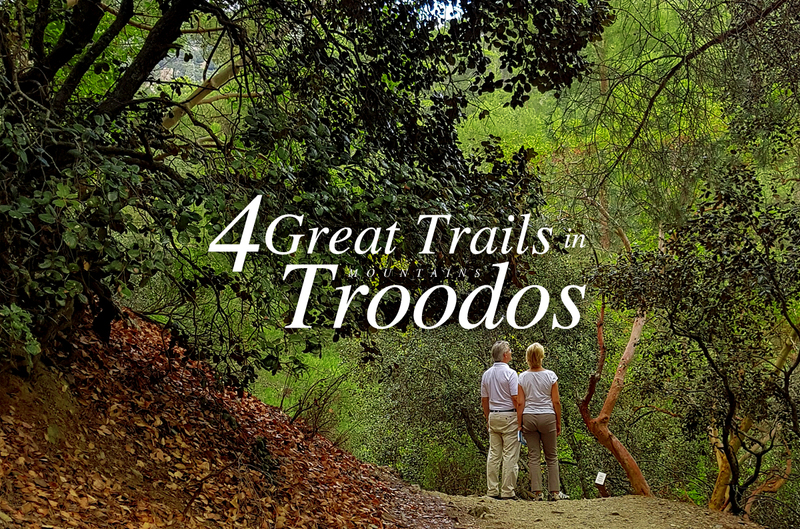 It is located within the National Forest Park of Troodos. ENDEMIC PLANTS: Troodos sage (Salvia willeana), Purple Rock - Cress (Arabis purpurea), Thorny gorse (Genista fasselata subsp. crudelis), Urse mint (Mentha longifolia subsp. cyprica), Aphrodite’s spurge (Euphorbia veneris), Golden oak (Quercus alnifolia). POINTS OF INTEREST: From the starting point (a) the trail passes through a dense forest and then runs alongside the Cold River (Krios Potamos), which has running water all year round. 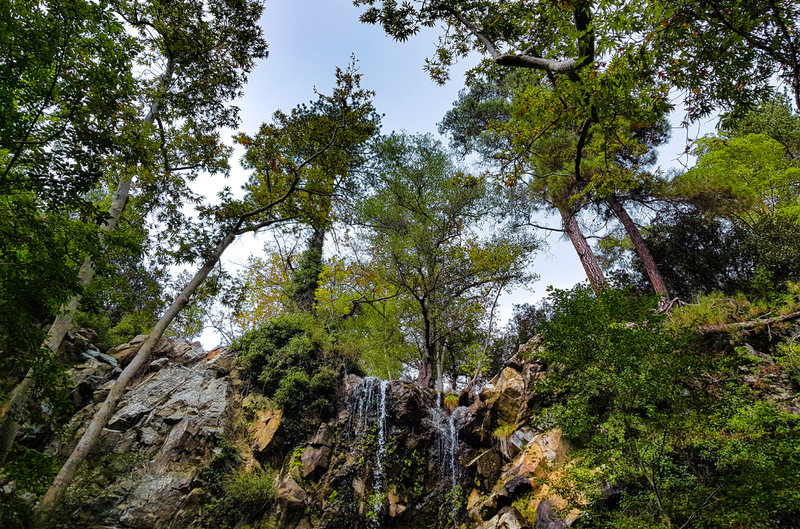 It then passes by the Kaledonia Waterfall and finishes at the Psilodentro in Pano Platres. 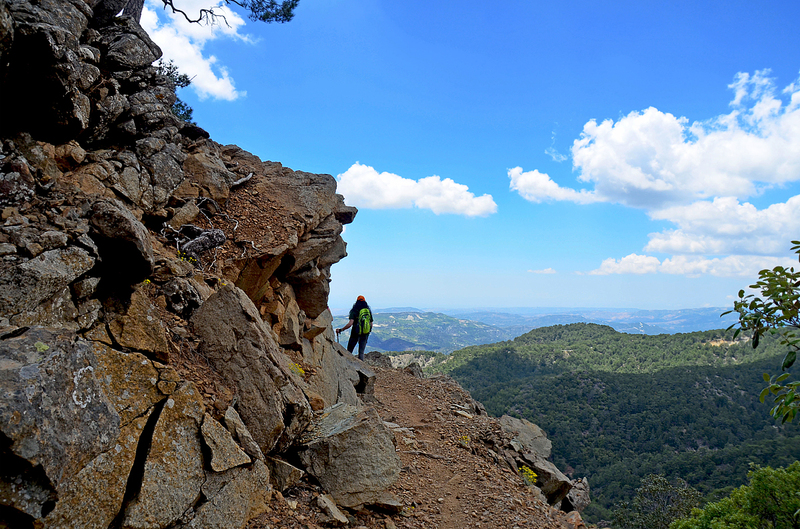 The trail is located within the Troodos National Forest Park. The E4 length of the route begins at starting point (a) and runs until the Kaledonia Waterfall. 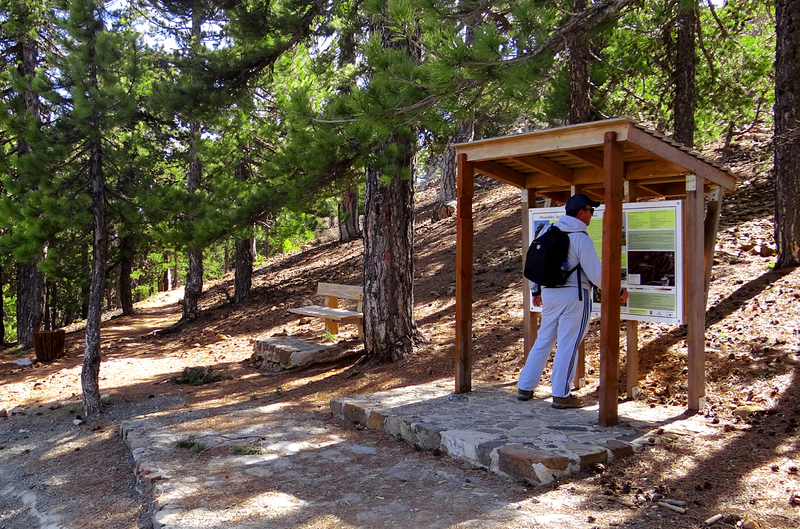 In Troodos Square you will find the Environmental Information Centre for the Troodos National Forest Park. Category 1: Easy trail, with gentle gradient. Suitable for all ages and fitness levels. Category 2: Average degree of difficulty, suitable for adults in fair to good fitness levels. Sudden changes in gradient (uphill and/or downhill), and/or course along narrow or rough terrain. Category 3: High degree of difficulty. Route with difficult terrain such as sudden changes in gradient (uphill and/or downhill), course along particularly rough and/or slippery, and/or narrow, and/or steep terrain. Suitable for adults in very good to excellent fitness levels. Unsuitable for young children.